Little is known about the 66m performance sloop Aglaia – but what is known is uniformly exceptional. Her 83m carbon mast is one of the tallest in the world and the largest ever produced by Southern Spars; Dubois designed her with targets such as hoisting the mainsail in less than two minutes and tacking the boat within 30 seconds; and her builder Vitters developed an innovative staysail furler for her. Suitably for a boat named after the Greek goddess of beauty and splendour, Aglaia is also a gorgeous-looking yacht. Chief among her charms is the painting by Norwegian artist Magne Furuholmen on her Code 1 sail, which at about 3,600m2 (both sides of the 1,787m2 Cuben Fiber sail) is one of the largest fabric paintings in the world. The owners had a series of Furuholmen pieces on board and after the christening chose to make this art a more integral part of Aglaia’s DNA – by putting his work on her sail. Furuholmen was given no specific brief and he told the owner he would make no sketches (‘you’re going to have to trust me’). For the artist and musician (Furuholmen was keyboardist and art director of the band Aha) the ‘natural approach is to find a linguistic point into the situation’. For the sail, he began with the Christian names of the owner’s family, the letters becoming a ‘personal alphabet’ to generate words. With these he created an abstract narrative (in the orange sections) – a family portrait in text. 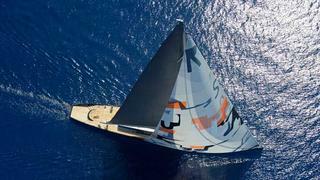 The final version was produced by the expert sail painters Harris Sailpainting, in Majorca.